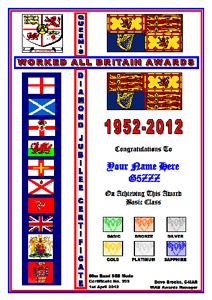 Please Note: The Diamond Jubilee Award has now finished. In 2012, Queen Elizabeth II will celebrate her 60th year on the throne � her 'Diamond Jubilee'. To celebrate this event, Worked All Britain are running an award � for 2012 only, which will be known as the Queen's Diamond Jubilee Award. The award will be open to all and will be available on all modes and all frequencies. The award will be based around the number �60� in recognition of the Queen's achievement. As with all W.A.B. 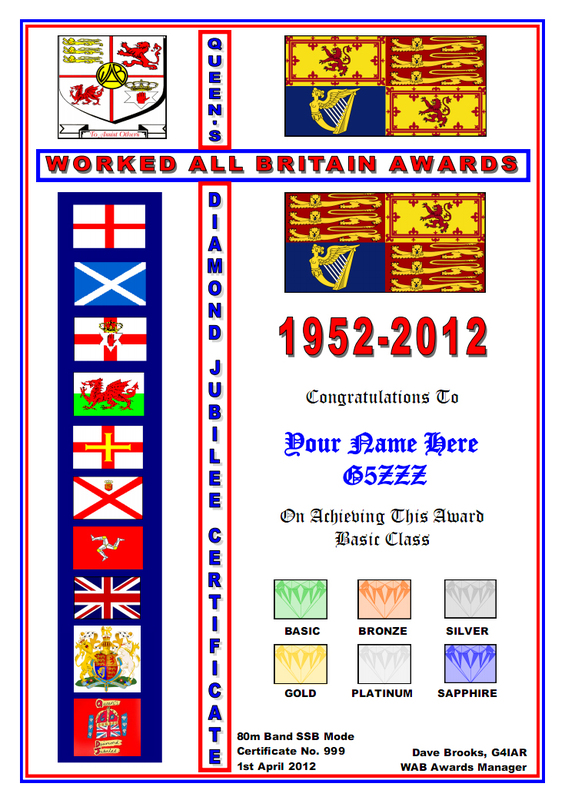 Awards, this is available to SWL's on a 'Heard' basis. There are seven classes of the Award: Basic, Bronze, Silver, Gold, Platinum, Sapphire and Diamond. A certificate will be issued up to the Sapphire level, with a trophy being awarded for the Diamond. Certificates will cost �1, unless claimed by an activator, in which case all awards are free. The trophies will be awarded free of charge, but we ask that the recipient either covers the cost of postage or collects the trophy at our 2013 A.G.M. To qualify, you must work/hear/activate different numbers of 'normal' (not ending in '60') W.A.B. Squares, plus Squares ending in the number '60'. The requirements are shown below. All contacts must be made within the 2012 calendar year, i.e. 1st January - 31st December 2012.